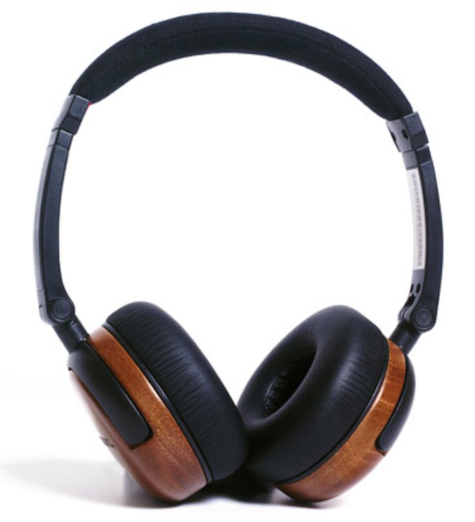 Plastic may be fantastic, but wood is definitely good for top quality personal audio speaker and headphone enclosures. Both thinksound and Audioengine use wood for optimum performance in their newest releases. Whether or not you, as consumer, care about both companies’ goals and claims, within a few minutes of listening to these new headphones and speakers you will be able to answer the most important questions: how do they look and feel and how do they sound? The On1 Monitor Series Headphones expand thinksound’s lineup to include on-ear headphones in addition to their excellent and affordable series of in-ear monitors. The construction of On1 is exceptionally solid and built to last many years, and the company offers replacement components as needed. Large on-ear memory foam earpieces fit snugly and comfortably, although eyeglass wearers may need to tip up their spectacles’ temple pieces for optimum comfort. Right and left monitors are well-marked. Each earpiece rotates 90 degrees to the rear, DJ-style, and folds inward for ease in carrying within the included cloth sack. Big head? Lots of hair? No problem! Ratcheted extensions add one inch to each side when fully expanded. The headband is constructed of gently spring-loaded metal covered by high-impact plastic adjacent to the earpieces, with foam fabric along the top. The latter is a delight for baldies. On1 is light in weight when held, packed, and when being worn. The polished natural wood speaker enclosures are substantial, but don’t add any bulk or weight. Two similar audio cables are provided for the single mini-audio 3.5mm port on the right ear attractive wood speaker housing. One cable is audio-only, and the other has a single button to enable answering calls when listening on a smartphone. The company CEO tells MyMac: “Apple keeps changing the functions‎. This is why we don’t list them. It’s different for all phones.” Other controls and operations must be done on your audio source equipment. These tangle-resistant fabric cables are unusually high quality, and are Kevlar reinforced. Most decent quality headphones and speakers require a break-in period to condition the speaker drivers. On1 sounds good immediately, and improves during the first hundred hours of listening, at which point it hits the sonic sweet spot. Bass player Charlie Hayden’s instrument comes through loud and clear in the classic folk song Wildwood Flower, on the Rambling Boy CD he made with his family and friends. Just as rich is the all-important midrange, containing crisp and present vocals and instruments, each in its own space within the stereo imaging provided by thinksound’s On1 headphones. Comfortable and great-sounding headphones have the effect of making you want to listen more, more, and then some more. Time recedes, phone calls and Internet messages are ignored, and your family members and roommates become increasingly annoyed with your obsessive listening. You have been warned: On1 headphones will take you to that place in life, given enough cash to buy them and enough appreciation of their finer points. Your other headphones will grow dusty and lonesome; give them away to another music listener. Bass and midrange are remarkable on jazzman George Kahn’s Compared to What? track on the CD of the same name. I never liked this song previously, but I am nuts about this version as it swings and evolves through instrumental and vocal verses and choruses. Treble excels at the upper horn registers and in the crystalline cymbal crashes with these headphones. There is no artificial coloration throughout On1’s entire sonic range, aside from what is built into the session mix on each original recording. Top quality headphones can be unforgiving when listening to less than stellar recordings, so be aware that what you hear from On1 Monitor Series Headphones is what was meant to be heard. Does the wood enhance the technology? 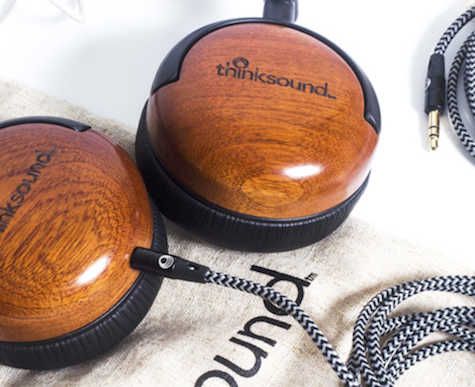 The sound certainly is smooth and natural, so let’s give thinksound credit for ingenuity and eco-awareness. 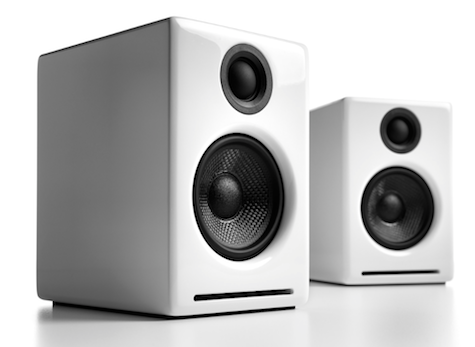 Audioengine’s new A2+ Powered Desktop Speakers don’t have a native sub-basement low range without a supplementary subwoofer that was not provided for our evaluation. But they do feature middle-tech looks, they are easy setup and use, and they sound fabulous in the crucial midrange and treble zones, plus the primary audible segment of the bass on the aforementioned Bach Concerto. Just as you can blow your brains out cranking up headphones past the midpoint on the volume slider, so can you turn the volume knob on A2+ all the way up and rock your house, apartment, office, and patio with these powered speakers. I know you can’t stand Billy Ocean’s Caribbean Queen, but it’s a track I use to test all audio equipment, and I know how it is supposed to sound. At top volume on my source device and on A2+ there is no distortion (hallelujah! ), and people tend to stand back, stand way back, from the diminutive speakers. Put this song on at peak volume and I guarantee your holiday guests will leave as soon as you are ready for them to depart. Speaking of listening distance, the premium A2+ are enjoyable to hear when nearby on your tech desk, across the room in your kitchen, or providing the soundtrack for your home theater system. 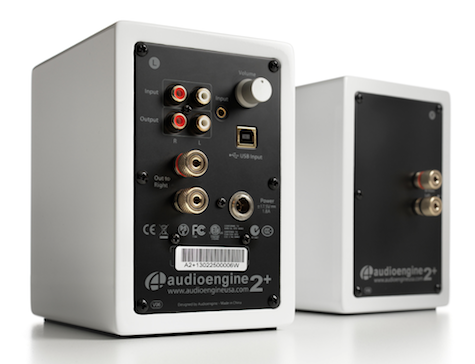 Audioengine includes “minijack, RCA, and USB inputs for easy connection to your computer or iDevice and other cables you may need are included. There is no software or plug-ins to install and A2+ works with any computer or music player.” Most non-techies will be satisfied using the minijack cable and port, and audio geeks will gladly utilize one or both of the other two methods of connecting A2+ to their source equipment. Bonus: there is no hum emitted by either the master right speaker or the slave left unit. Jazz benefits very well from these Audioengine speakers, and the music becomes immersive in a way that most speakers in this price range can not deliver. There are limits to the upper treble register in the design of all small premium speakers if they are built to showcase their midrange, but this is an observation, not a criticism. There is a warmth and a separation from wooden speakers playing in a physical space that no headphones can match, especially in the midrange. Try different placement positions when you take your 30-day audition from Audioengine until you experience the music as it is meant to be heard and felt. As with the thinksound On1 headphones, you will cherish your A2+ speakers and have them for many years. Both companies develop their products with serious music lovers in mind and fair value pricing, so save your nickels and dimes, or put one or both of them on your gift wish list.